It happened a week ago, but I needed some time to sort out my feelings. It’s complicated, because Alexandra Dulgheru is Romanian (i.e., from my native country) and Eugenie Bouchard is Canadian (i.e., from my adoptive country). Alex is nicer and a winner, Genie is a blonde, confirming the stereotypes that come with that categorization. If you’re not familiar with the event, it featured the Canadian champ and #7 in the world Eugenie Bouchard and Alexandra Dulgheru, currently #72 with a career high of #26 in 2011, eroded since then by repeated knee injuries, but currently on a multi-year, hard worked rebound. CTV News in Montreal covered the event impartially (ctv-bouchard). Westmount’s Eugenie Bouchard left an opponent hanging Friday when she declined to shake the outstretched hand of her upcoming rival at a Fed Cup pre-match press conference in Montreal. Bouchard was posing for photos with 66th-world-ranked Alexandra Dulgheru of Romania who put out her hand to shake for the cameras. Bouchard smiled and looked Dulgheru in the eye but did not unholster her right hand, which remained poised stiffly at her side. "It's nothing personal towards her. I just don't believe in wishing my opponent good luck before the match. After we play I will shake her hand, no matter what happens," Bouchard told a Romanian TV crew. The tactic proved ineffective, as hometown favourite Bouchard lost in straight sets, 6-4, 6-4, in front of a crowd of vocal Romanian supporters. The Romanian team jokingly celebrated amongst each other following the victory by pulling back on handshakes with each other. Bouchard did the same to Kristina Kucova of Slovakia last year. Canada and Romania are battling for a spot in the 2016 Fed Cup World Group. This isn't the first time Bouchard has refused a handshake. Last year, at another Fed Cup World Group pre-match ceremony, she gave the cold shoulder to Kristina Kucova of Slovakia in a similarly awkward moment. Bouchard went on to lose against Mitu as well, causing the Canadian team to lose to Romania. The underdog of the Canadian team, Francoise Abanda (born ‘97), won against Begu but lost against Dulgheru. And I could not be happier with any of these results. So did ctp, falling for an obvious rhyme, though I find his choice of words questionable. The sweet Abanda story, as told by the Toronto Star, interspersed with Bouchard’s loss, may partly explain why I’m so happy for Francoise. There was no way to predict that 18-year-old Françoise Abanda, currently ranked No. 260 and the sixth-highest ranked singles player in Canada, would upset world No. 33 Irina-Camelia Begu. But she did, 4-6, 7-5, 6-4 in two hours and 40 minutes. It was by far Abanda’s finest win in terms of the ranking of her opponent. And it was by far the most unexpected result of the day. “Although she felt a little bit of discomfort (Begu’s calf was cramping at times during the last hour of the match), she fought hard. I was just happy to get through it, and get my first win in Fed Cup in Montreal — in my hometown,” Abanda said. As for No. 1 Canadian Genie Bouchard, the last-minute addition to the Canadian squad . . . well, karma sort of came back and bit her in the backhand. The 21-year-old lost yet another match during her spring of discontent, 6-4, 6-4 to 25-year-old Alexandra Dulgheru, an experienced player whose former top-30 ranking was decimated by several years of injuries and is just finding her form again. “It wasn’t a great performance tennis-wise, but I fought for every single point. I feel where I’m coming from, it was the step in the right direction,” Bouchard said. The match was an unexpected opportunity to give Canada a daunting 2-0 lead after the first day, by building upon what Bouchard’s much-younger teammate managed to do in the first match. Dulgheru was the player left hanging — literally — at Friday’s draw ceremony, her right arm extended to shake Bouchard’s in the traditional Fed Cup (and Davis Cup) gesture of friendship between nations. At that moment, Bouchard announced she would “pass.” Red-faced and slightly embarrassed, Dulgheru later said it was an awkward moment. Bouchard responded it was “nothing personal”, simply that she didn’t believe in wishing good luck to her opponent before a match. It was a scenario that first occurred a year ago in Fed Cup, in a similar tie in Quebec City against the Slovaks, and surprisingly repeated itself here after all the negative fallout that happened then. The Romanian returned the favour with interest Saturday where it mattered, on the court. She was solid, steady and, above all, nicely motivated. “The thing about Fed Cup is that it’s a spirit kind of competition, and it’s about fair play, and about all those good values. Doing (what Bouchard did) goes a bit in contradiction with those values. It was a bit awkward, so maybe that motivates me a bit more,” said Dulgheru, who ran over to her teammates and support staff after the victory. They all put their arms out to shake — only to pull them away at the last moment. The meaning of that was lost on absolutely no one. “Yes, it was a bit of a response to what Genie did. But it was a bit more of our joke,” Dulgheru said. Abanda was two games away from doing just that, up 6-4, 4-2 against Alexandra Dulgheru in the fourth singles match. She ran out of gas, not a surprising development after her draining victory over world No. 33 Irina-Camelia Begu on Saturday. Dulgheru finally found her rhythm after struggling early to make the adjustment from the harder-struck ball she faced when she defeated Genie Bouchard on Friday. Dulgheru’s 3-6, 7-5, 6-2 victory clinched the tie for Romania, which will move into the top level of Fed Cup, the eight-nation World Group I, for the first time in decades. “I was definitely the underdog. I’m the lowest-ranked out of the eight girls here, and the youngest. I gave it everything I had, I gave my full effort and I just hope every girl gave her 100 per cent,” Abanda said. “If that’s the case, there’s nothing more we could have done. Before Abanda’s effort, top Canadian Genie Bouchard had a terrific opportunity to give Canada a 2-1 lead. Instead, she suffered arguably the worst of the losses that have become a bad habit the last few months. In Andreea Mitu, who substituted for Begu, the Canadian star faced a player currently at a career-best No. 104. The 23 year old has won plenty of tennis matches in places like Curitiba and Cancinas and Jou-les-Tours and Podgorica and Mamaia and Woking and Trnava, but won her first-ever main-draw match at a WTA Tour event just two weeks ago in Charleston. “I’m having the sophomore slump you guys are all talking about, so I’ll leave it at that,” Bouchard said. “I might have lost my focus a little bit (in the second set) and it all started going downhill. Bouchard squeezed out the first set, somehow. And then, it was as though she took elements from all of her other tough losses this winter and put them all in one place. There were the clusters of unforced errors, too many born of impatience and lack of confidence. There were tears. There were the racquet tosses and racquet bounces and anxious glances at her support team. But the worst part, a new wrinkle, was the resignation — Bouchard flat-out gave up. By the end, she didn’t even move for some of the shots from an untested opponent who, albeit in rather different style, very much did what Bouchard herself was doing when she was playing her best tennis a year ago. After this exhaustive look at what has happened, I can finally tell you what I like, what I dislike, and why. First, I’m happy that Abanda, Mitu and Dulgheru won, and, conversely, that Bouchard lost. I always prefer to root for the underdog (pt-r4u, v-ud), and this has nothing to do with “allegiances” – a big word here in Canada, especially since more and more people want to get rid of the Queen. And yet, there’s more to it than rooting for the underdog. Eugenie Bouchard, though beautiful, seems to be transforming into an arrogant, A-type personality A**hole. Still, Bouchard does not consider Sharapova her friend, even though she grew up idolizing her and they are both sponsored by Nike. She says in an interview that Sharapova is not may friend. It’s worth remembering that Sharapova made it to the USA without her mother and only with her father, who worked at first as a dishwasher in order to afford to pay for his daughter’s tennis lessons, while Bouchard was born to the wife of an investment banker. Bouchard’s father’s idea of help was to set up a limited partnership, “Tennis Mania”, with two friends, where each contributed money in exchange for 10% of Bouchard’s future earnings. Is there any wonder that her ethics and motivation are in flux? 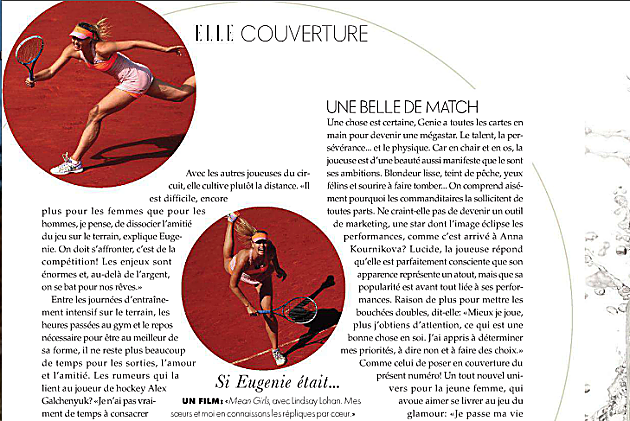 Perhaps it should then surprise nobody that when Elle Quebec dedicated a large article to her in August 2014, they got right only the cover, with the article plastered with Sharapova’s photos. Her Chic cover and Flare Instagram (fl-eb) are way better. I doubt “Genie” will ever read this blog (which, BTW, gives me the freedom to say exactly what I think), but here’s what I have to say to her. You’re an a##hole. I know it’s hard to be something else when you were raised by that father of yours (za-alex), and I know he was and maybe still is your hero, and you didn’t get to choose your parents. But there comes a time when you need to distinguish between good advice coming from people who may not be your friends and / or relatives and bad advice coming from those close to you. I took Shotokan when I was a kid, and was quite “into it”. Would put on a scary face, exaggerated breathing, and the works. My Sensei had a word with me and tried to explain that being overly concerned with winning is not the way. Real winners manage to stay detached and serene and win without being a##holes. It’s about flow. Wishing the best to your opponent before a game is a way to “depersonalize” a potential loss. In the end, it’s just a game. Of course you want to win, but not at the cost of losing your humanity. You’re not a robot. Nor are you an emotional idiot who needs to hate their opponent. Standing out in the way you did will only attract everyone’s contempt. Finally, you might think you are being more “authentic” by skipping that handshake, much like idiots who think that expressing racist thoughts or general prejudice makes them “real” because “everybody thinks that”. Instead, all that you’re showing is that your mind is not sufficiently developed to understand that this is not about political correctness. It’s about being part of something bigger than yourself, with all the conventions and logic that come out of it: being human and not just any human, a winner. You’ll be winning many more matches to come and I hope you will find a man that’s a cross between Bieber and Federer, but trying to win at all costs will only make you a loser. More Bouchard eyecandy: CTV The Social, Flair, Tout, La Presse, Toronto, Hot, Beach, Parsons, Weather, Workout. Thank you for reading (mulţam fain pentru cetire)! Publicat Sunday, April 26, 2015 . Similar articles under the following categories (poţi găsi articole similare sub următoarele categorii): canada ( ), etica ( ), lucrand la fatada ( ), sport ( ) . Dacă ţi-a plăcut articolul, PinIt-uieste-l, ReddIt-eaza-l, stumble-uieste-l altora, trimite-l pe WhatsApp yMess şi consideră abonarea la fluxul RSS sau prin email. Ma poti de asemenea gasi pe Google. Trackback poateputea fi trimis prin URL-ul de sub Comentarii.